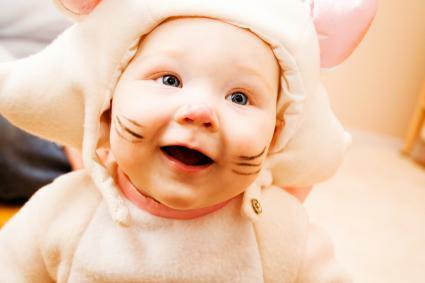 Halloween is an exciting holiday for kids and adults alike. From decorations and trick-or-treat bags to elaborate costumes for kids of all ages, you can create the project of your dreams with the right Halloween sewing pattern. It's all about choosing a pattern that is perfect for your sewing experience level, budget and project needs. In addition to the pattern section at your local fabric store, you can find a huge selection of Halloween patterns online. Some sites offer patterns for free, and others charge a small fee for their designs. Either way, finding sewing patterns online is an affordable way to make that perfect costume or party decoration. AllCrafts has hundreds of free patterns for Halloween crafts, including several sewing patterns for costumes and other holiday items. AllFreeSewing offers more than two dozen free sewing patterns for Halloween decorations, masks, costumes and treat bags. Better Homes and Gardens has a great free pattern for a reversible pillow with a Halloween motif. Sewing.org offers lots of great free patterns for Halloween projects, from wall decorations to costumes. Love To Sew has a great selection of fun Halloween patterns for everything from stuffed candy corn to placemats. SewingPatterns has a searchable site with dozens of great costume patterns, as well as pattern reviews. Simplicity.com has lots of great Halloween patterns for costumes and more. McCall's Patterns offers hundreds of options in an easy-to-use online shop. Vogue Fabric Store sells Kwik-Sew patterns for costumes of all kinds, including adorable costumes for babies and toddlers. Etsy.com has a vintage section with hundreds of great Halloween patterns from past years. This easy pattern is perfect if you're working with kids. You can teach basic sewing skills while making something fun and functional. Use the large round container and fabric pencil to trace a circle on each piece of black felt. Cut the circles out. To make whiskers, sew several pipe cleaners in a group to the center of one of the circles. Sew a pink button on top of the pipe cleaners for the nose. Cut a small tongue shape out of pink felt, and sew this just below the pipe cleaner whiskers. Use hot glue to attach the googly eyes. Children will need plenty of adult help for this step. Cut pointed ears out of the pink felt, and sew them to the face. Place the face on top of the plain circle of felt, and use black embroidery floss and a blanket stitch to sew the two pieces together. Leave the top section open to allow kids to put treats in the bag. Sew orange ribbon to the top for a handle. Consider your sewing experience level. Patterns are usually marked with their difficulty level, and most multi-pattern sites have projects that will work for a range of seamstresses. If you're looking for an easy project but don't see any guidelines, choose something with fewer than ten steps. Think about the kind of Halloween project you'd like to make before you begin looking at patterns. You can make holiday decorations like wall hangings, throw pillows and table centerpieces. You can also make costumes for children and adults and treat bags to hold all that candy. Knowing what you'd like to make will help you choose the pattern you need. Keep your budget in mind. Even though some patterns are free, you'll still have to pay for the materials to make the project. Price out various projects to compare the cost. You may find that it makes sense to pay for a more expensive pattern if you can create the item with fewer materials. Don't forget to add your own creative stamp to any Halloween project you make. Just because Halloween sewing patterns tell you how to assemble an item, doesn't mean you need to follow the decorating directions to the letter. This is a great time to experiment.